Odin (Old Norse: Óðinn) is the chief god in Norse mythology whose role in the Norse pantheon is complex and multivalent: he is known as the god of wisdom, death, and victory in battle but is also revered as a god of magic, poetry, prophecy, and the hunt. However, unlike many father-ruler gods, Odin is not described as a moral exemplar and is often seen winning battles and out-maneuvering opponents using guile, trickery and outright deception. Further, as he is seen as the lord of warriors who have fallen in combat, and is occasionally depicted inciting his human constituents into battle—once again, often using duplicitous means. Though not as popular as Thor among the common people, Odin was still the recipient of considerable veneration, especially from members of the upper classes. He was also one of the three deities found in the major "pagan" temple at Uppsala, Sweden, where animals were slaughtered and men were hung to death as consecrated sacrifices to the "Gallows God" (one of Odin's many sobriquets). Odin's name derives from the Proto-Germanic *Wōđinaz or *Wōđanaz and is related to óðr, meaning "excitation," "fury" or "poetry." As a Norse deity, Odin belonged to a complex religious, mythological and cosmological belief system shared by the Scandinavian and Germanic peoples. This mythological tradition, of which the Scandinavian (and particularly Icelandic) sub-groups are best preserved, developed in the period from the first manifestations of religious and material culture in approximately 1000 B.C.E. until the Christianization of the area, a process that occurred primarily from 900-1200 C.E. The tales recorded within this mythological corpus tend to exemplify a unified cultural focus on physical prowess and military might. Odin is generally recognized (at least in the received sources) as the leader (or even the father) of the Aesir. According to the Prose Edda of Snorri Sturluson (1178–1241 C.E. ), Odin is the first and most powerful of the Aesir. Despite this high status, he is an ambivalent deity, who is much more likely to arouse awe and fear than love, respect or veneration. His name, in the Old Norse language, connotes rage or frenzy, which was taken to refer to either “poetry and inspiration" or to "fury and madness" (leading many to assume that his name refers to the battle-rage of the famed Norse berserkers). Odin is a God of wisdom (both worldly and arcane), visually symbolized by his one-eyed visage, as a popular myth describes him sacrificing his eye for a drink from Mimir’s fountain, which gave him knowledge of the end times (Ragnarok). An oft-told story depicts his craftiness in stealing the "mead of poetry" from the giants, saving most of the skill for himself, but also making it available to fortunate human poets. of what roots it runs. I learned nine mighty songs. This particular episode creates a reasonable parallel between the deity and the shamanistic practice of ritual death in service of magical initiation. Though not directly related to physical bravery or the art of combat (as were Thor and, to a lesser extent, Tyr), Odin was also understood in the context of war—specifically as a bringer of victory. By launching his dwarven-crafted javelin Gungnir over the enemy ranks, he was able to instill panic, blindness and numbness in the opposing troops, while simultaneously bolstering the courage and resolve of any army he favored. However, he was also associated with the dead of war—specifically, those who died honorably in combat. From their ranks, Odin, and his warrior-messengers, the valkyries (literally, "dead choosers"), recruited his troops of einherjar, who lived at his side in Valhalla and would fight alongside the Aesir in the war of the apocalypse (Ragnarök). Commenting on this martial role for the "father god," Dumézil notes, "in the ideology and in the practices of the Germanic peoples, war invaded all, colored everything." While Odin is typically described as an old man with a staff (one-eyed, grey-bearded, and wearing a wide-brimmed hat, with a blue traveling coat), he is also described as a shapechanger who is able to alter his skin and form at will. In iconography (both religious and popular), Odin's power or presence are often represented by the Valknut—a symbol constructed of three interlocking triangles. Worship of Odin dates back to early Germanic paganism. The most compelling evidence of this historical connection is found in the accounts of Tacitus and Julius Caesar, who describe the Germanic pagans participating in a cult of "Mercury" dedicated to a figure matching Odin in both attributes and areas of patronage. Thus, it is theorized that Scandinavian Óðinn emerged from Proto-Norse *Wōdin during the Migration period (especially 100 B.C.E. - 600 C.E.). The archaeological record bolsters this conjecture, as Vendel artwork (bracteates, image stones) depicts scenes that can be aligned with the High Medieval Norse mythological texts. Further, the context of the new elites emerging in this period aligns with Snorri's (euhemeristic) tale of the indigenous Vanir who were eventually replaced by the Aesir, understood as intruders from the continent. Additionally, parallels between Odin and Celtic Lugus have often been pointed out: both are intellectual gods, commanding magic and poetry. Both have ravens and a spear as their attributes, and both are one-eyed. A likely context of the diffusion of elements of Celtic ritual into Germanic culture is that of the Chatti, who lived at the Celtic-Germanic boundary in Hesse during the final centuries before the Common Era. However, it must be remembered that Odin in his Proto-Germanic form was not the chief god, but that he only gradually replaced Tyr during the Migration period. From Ymir's flesh, the brothers made the earth, and from his shattered bones and teeth they made the rocks and stones. From Ymir's blood, they made the rivers and lakes. 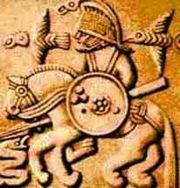 Ymir's skull was made into the sky, secured at four points by four dwarfs named Nordi, Sudri, Austri, and Westri (North, South, East, and West). And from Ymir's brains, they shaped the clouds and Ymir's eyebrows became Midgard, the place where men now dwell. In this account, Odin and his brothers are also attributed with creating mankind from hollow logs. In doing so, Odin first gave them breath and life; Vili gave them brains and feelings; and Ve gave them hearing and sight. The first man was named Ask and the first woman was Embla, and from them all families of mankind are descended. Furthering this understanding of Odin as "All-Father," he also had several wives with whom he fathered many children. With his first wife, Frigg, he had two sons: Balder, who stood for happiness, goodness, wisdom and beauty, and the blind god Hod, who was representative of darkness (and presented a perfect contrast to Balder's light). By the Earth Goddess Jord, Odin sired his most famous son, Thor the Thunderer. In addition to these offspring, he is also described as the father of lesser deities (including Vidar and Vali) and of many royal lineages among humans. Some other important myths surrounding Odin include the sacrifice of his eye for a vision of the future and his nine-day crucifixion (suffered in order to receive the ability to perform feats of magic; both described above). In his eschatological vision (of Ragnarok), Odin sees that the Aesir will eventually be killed in their final battle with the giants (Jotun), and that he himself will die in the clutches of Fenrir—a demonic wolf spawned by Loki. Also important is the tale of his theft of the "mead of poetic inspiration" from the giants who had been guarding it - an account that revels in the god's quick-witted improvisation, shape-changing abilities and outright manipulation of the unwitting. Finally, Odin is featured in many of the heroic sagas, often granting temporary victory to the human warriors, though frequently depicted as requiring them to agree to sacrifice themselves (or their loved ones) in order to achieve their ends. It is attested in primary sources that sacrifices were made to Odin during blóts (Blood sacrifices to the gods). Adam of Bremen (eleventh century) relates that every ninth year, people assembled from all over Sweden to sacrifice at the Temple at Uppsala, where male slaves and males of each species were sacrificed and hanged from the branches of the trees. Sacrifices were probably also made to Odin at the beginning of summer, since Ynglinga saga states one of the great festivals of the calendar is at sumri, þat var sigrblót ("in summer, for victory"). This particular phrase is significant, as Odin is consistently referred to throughout the Norse mythos as the bringer of victory. In addition to these prescribed sacrifices to Odin, more happenstance ritual offerings were also made in order to bring about changes in circumstances. A notable example is the sacrifice of King Víkar that is detailed in Gautrek's Saga and in Saxo Grammaticus's account of the same event. Sailors in a fleet being blown off course drew lots to sacrifice to Odin that he might abate the winds. The king himself drew the lot and was hanged. In a like manner, the sagas relate that both King Domalde and King Olof Trätälja were sacrificed to Odin after years of famine by commoners seeking a divine reprieve. The Ynglinga saga also details the sacrifices made by the Swedish king Aun, who, it was revealed to him, would lengthen his life by sacrificing one of his sons every ten years; nine of his ten sons died this way. When he was about to sacrifice his last son Egil, the Swedes stopped him. Finally, this understanding of "death as sacrifice" extended to the field of battle as well, where the killing of a combatant was interpreted as a sacrificial offering to Odin. Onsøy (Norse: Óđinsøy; Odin's island), name of a peninsula (and also name of a parish and a former municipality) in the county of Østfold. Óđinsakr (Odin's field/acre), name of three farms (in the parishes Svinndal, Gran and Hole). Óđinsvin (Odin's meadow/pasture), name of three farms (in the parishes Buvik, Byneset and Meldal). Óđinsland (Odin's land), name of two farms (in the parishes Bru and Kyrkjebø). Óđinssalr (Odin's hall), name of two farms (in the parishes Onsøy and Melhus). Óđinshof (Odin's temple), name of a farm in the parish of Ullensaker (the names of the farms are given in the Norse form). With the Romantic Viking revival of the early-to-mid nineteenth century, Odin's popularity increased again. 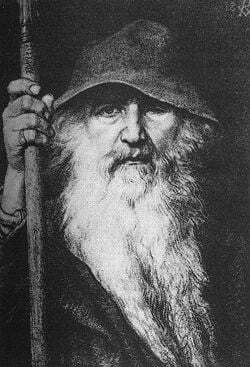 Odin (as Wotan) is one of the main protagonists of Richard Wagner's opera cycle, Der Ring des Nibelungen. This depiction in particular has had influence on many subsequent fiction writers and has since resulted in varying references and allusions in multiple types of media. Gandalf, the wizard of J. R. R. Tolkien's The Lord of the Rings, is largely based on Odin in his incarnation as "the Wanderer," an old man with one eye (though Gandalf retains both of his), a long white beard, a wide brimmed hat, and a staff. In fact, Tolkien explicitly states that he thinks of Gandalf as an "Odinic wanderer" in a letter of 1946 (Letters no. 107). Odin, along with the other Germanic Gods and Goddesses, is recognized and venerated by Germanic neopagans. 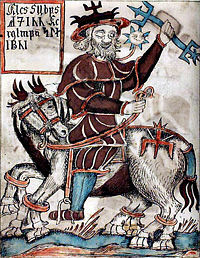 His Norse form is particularly acknowledged in Ásatrú, the "faith in the Aesir," an officially recognized religion in Iceland, Denmark, Norway and Sweden. The Norsemen ascribed many sobriquets to Odin, in keeping with the Norse skaldic tradition of kennings, a poetic method of indirect reference. The name Alföðr ("Allfather," "father of all") appears in Snorri Sturluson's Younger Edda, though it probably originally denoted Tyr, as it fits the pattern of referring to Sky Gods as "father." ↑ One of the major sources for depictions of these ritual practices comes from Adam of Bremen, an eleventh century cleric, chronicler, and missionary. Described in Dubois, 60; Munch, 8-9. However, given the source's definite "anti-pagan" stance, it is perhaps advisable to approach these statements with a critical mindset. ↑ These linguistic roots are also the source of the Anglo-Saxon Woden. ↑ Note: This connection with divine wisdom led many Roman philosophers and chroniclers, from Caesar and Tacitus on, to relate Odin with Mercury/Apollo. See Dumézil, 19. ↑ A reference to Yggdrasil, the famed World Tree of Norse mythology. See Lindow, 248. ↑ Hávamál (strs. 138-45), quoted in Turville-Petre, 42. ↑ See Dumézil, 19, and also Julius Caesar's de bello Gallico (6.17.1), which mentions "Mercury" as the chief god of Celtic religion. ↑ Rundkvist, Martin. 2003. Post festum. Solid gold in the Vendel Period. Retrieved March 22, 2007. ↑ Paraphrase from the Prose Edda as translated by Arthur Brodeur, p. 20. ↑ DuBois, 43, 60; Turville-Pietrie, 50-55, 64-70. 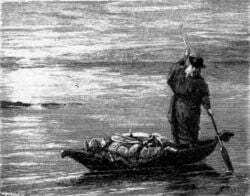 ↑ Also the name of a river, one of the Élivágar. ↑ Also an assumed name used by Gylfi. ↑ Also the name of a brother of Loki. ↑ This table reproduced (with some amendments) from Wikipedia. Also, many of these names are attested to in the Poetic Edda's Skáldskaparmál (II), (97-103 in the Brodeur edition). This page was last modified on 18 December 2018, at 15:14.